Each week we (LIVEdigitally) will post between one and four “contest posts”. Your mission should you choose to accept: find the “contest post” of the week (there may be more than one) and leave a comment. As long as your comment has a valid email address, that you have access to, then you are an eligible candidate for the hot, sleek, protective, Shockshell case. The content of your comment is not required to contain anything specifically iPod, Slappa, LIVEdigitally related. A haiku written strictly about how good looking I am is just as eligible as a paragraph explaining how your ex-girlfriend now dates your exbest-friend. Winners will be chose at random, and contacted via email. There are two posts that have gone up today which qualify as “contest posts” so keep your eyes peeled and your browsers open, LIVEdigitally is going to hook you up!! « Is it luggage or a CD case? Pingback: LIVEdigitally » Is it luggage or a CD case? Don’t forget to leave your email address!!! Whoa !!! Are these cases cool or what? Gives a 47 year old Dad and a 14 year old daughter something to get excited about, and something to talk about for a good 15 minutes while waiting for the bus!!! Whoa!!! I NEED one to bring back thousnads of pictures of my beautiful grandchildren home from Christmas. 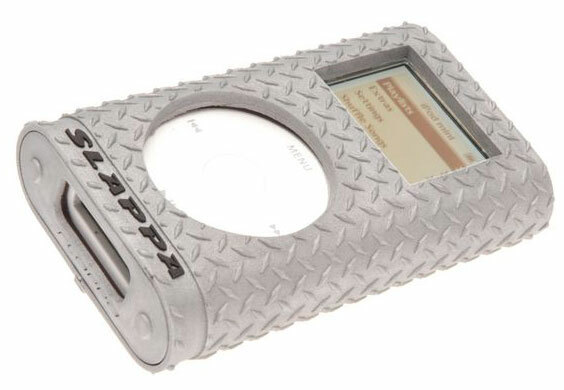 i really like the mp3 player that was advertised and i think it would look great with the case!!!!! He-he. We will be waiting. Cross-finger.